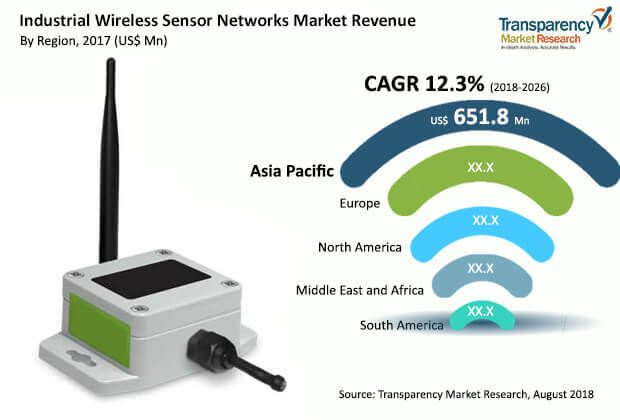 The global industrial wireless sensor networks market was valued at US$ 1,950.6 Mn in 2017 and is projected to register compound annual growth rate (CAGR) of over 12.3% from 2018 to 2026, according to a new report published by Transparency Market Research (TMR) titled “Industrial Wireless Sensor Networks Market – Global Industry Analysis, Size, Share, Growth, Trends, and Forecast, 2018–2026.” The report suggests that the better reliability and availability of industrial wireless sensor networks as compared to conventional industrial wired sensor networks is likely to spur the demand for industrial wireless sensor networks in the coming years (2018 to 2026). As key players introduce new industrial wireless sensor networks technology and solutions in developed markets such as North America, Europe, and Asia Pacific, these regions are likely to account for dominating share of this market. Growing demand for industrial wireless sensor networks from the manufacturing sector in emerging markets such as China and India is likely to boost growth of the Asia Pacific industrial wireless sensor networks market at a growth rate of around 16.1% from 2018 to 2026. Although conventional industrial wired sensor networks can operate in an industrial setting, they are very costly and inefficient. Industrial wireless sensor networks on the other hand are much more efficient. Considerable cost is saved on industrial wireless sensor networks as there is less wiring used. Industrial wireless sensor networks can also be placed in locations which are technically unreachable, giving them an edge over their conventional counterparts. Industrial wireless sensor networks have a higher penetration in developed economies as compared to developing economies. Based on type, the industrial wireless sensor networks market is segmented into Flow, Gas, Temperature, Pressure, and Others (Level, Humidity etc.). In 2026, others sub-segment is expected to hold more than one third of the total market and expand at a steady rate throughout the forecast period. Industrial wireless sensor networks not only improve efficiency but also reduce maintenance costs due to comparatively less wiring and connections than conventional wired sensors. In terms of technology, the market is segmented into Bluetooth, ZigBee, Wi-Fi, Near Field Communication (NFC), Cellular, and Others (wirelessHART, ISA 100.11a etc.). Primarily driven by battery efficiency, the ZigBee sub-segment is expected to hold a bulk share of the total market and grow at a rapid pace throughout the forecast period. On the basis of industry, the market is segmented into automotive, food & beverages, manufacturing, mining, oil & gas, and others. In terms of value, Asia Pacific was the leading contributor to the global industrial wireless sensor networks market in 2017. The contribution is primarily due to the increased adoption of industrial wireless sensor networks with the presence of well-established players across the region, especially across China and Japan. Europe, which is home to many well-established players from the industrial wireless sensor networks market is expected to follow Asia Pacific in terms of market share in 2017. Furthermore, Asia Pacific is witnessing high adoption of industrial wireless sensor networks owing to the increasing demand for sensor networks for local manufacturing units. Major players in the industrial wireless sensor networks market include Lantronix, Inc., NXP Semiconductors N.V., Analog Devices, Inc., Texas Instruments Incorporated, STMicroelectronics N.V., Yokogawa Electric Corporation, Endress+Hauser AG, Schneider Electric SE, ABB Ltd, and Siemens AG.